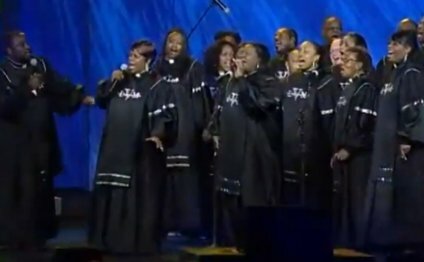 Halfway through Declaration of Dependence, the Mississippi Mass Choir’s latest album, I realized that the choir has inherited the mantle once worn by the celebrated Thompson Community Singers. Just as music ministers could not wait for the latest Tommies album to discover new songs and arrangements to teach their church choirs, Mississippi Mass Choir albums offer the same opportunity for today’s directors. Miss Mass hits such as “He’ll Carry You, ” “God Made Me, ” and “When I Rose This Morning” went from CD to choir lofts around the country. Released last June, Declaration of Dependence offers several selections tailor made for a church choir. One is the up-tempo “I’ll Stick With Jesus, ” led by traditional gospel maven Bishop Neal Roberson. Another is “I’ve Got Jesus, ” a new arrangement of “I’ve Got Jesus and That’s Enough For Me, ” rendered with conviction by the choir’s singer laureate, Mosie “Mama” Burks. “Waymaker” is another infectious roof raiser. Yet another, “God’s On Your Side, ” is an antiphonal ballad of encouragement featuring lead vocals by Stan Jones and Le’Andria Johnson. Make sure you catch Johnson’s humorous comment at the conclusion. Meanwhile, Lecresia Campbell provides a tour de force of church soloist athletic improvisation on the hymn, “Draw Me Nearer.” She stretches vocal lines like salt water taffy and jumps scales with dexterity, while Marcus Singleton encourages her on organ. The big, bold, dense, voluminous harmonies that represent the Mississippi Mass Choir sound are front and center on Declaration of Dependence. Good thing. Many churches depend on the group’s oeuvre for their own Sunday showcase.